The research community now has a new framework toward developing a biologically-based definition of Alzheimer's disease. This proposed "biological construct" is based on measurable changes in the brain and is expected to facilitate better understanding of the disease process and the sequence of events that lead to cognitive impairment and dementia. With this construct, researchers can study Alzheimer's, from its earliest biological underpinnings to outward signs of memory loss and other clinical symptoms, which could result in a more precise and faster approach to testing drug and other interventions. The National Institute on Aging (NIA), part of the National Institutes of Health, and the Alzheimer's Association (AA) convened the effort, which as the "NIA-AA Research Framework: Towards a Biological Definition of Alzheimer's Disease," appears in the April 10, 2018 edition of Alzheimer's & Dementia: The Journal of the Alzheimer's Association. Drafts were presented at several scientific meetings and offered online, where the committee developing the framework gathered comments and ideas which informed the final published document. The framework, as it undergoes testing and as new knowledge becomes available, will be updated in the future. The framework will apply to clinical trials and can be used for observational and natural history studies as well, its authors noted. They envision that this common language approach will unify how different stages of the disease are measured so that studies can be easily compared and presented more clearly to the medical field and public. "In the context of continuing evolution of Alzheimer's research and technologies, the proposed research framework is a logical next step to help the scientific community advance in the fight against Alzheimer's," said NIA Director Richard J. Hodes, M.D. "The more accurately we can characterize the specific disease process pathologically defined as Alzheimer's disease, the better our chances of intervening at any point in this continuum, from preventing Alzheimer's to delaying progression,"
This framework reflects the latest thinking in how Alzheimer's disease begins perhaps decades before outward signs of memory loss and decline may appear in an individual. In 2011, NIA-AA began to recognize this with the creation of separate sets of diagnostic guidelines that incorporated recognition of a preclinical stage of Alzheimer's and the need to develop interventions as early in the process as possible. The research framework offered today builds from the 2011 idea of three stages–pre-clinical, mild cognitive impairment and dementia–to a biomarker-based disease continuum. The NIA-AA research framework authors, which included 20 academic, advocacy, government and industry experts, noted that the distinction between clinical symptoms and measurable changes in the brain has blurred. The new research framework focuses on biomarkers grouped into different pathologic processes of Alzheimer's which can be measured in living people with imaging technology and analysis of cerebral spinal fluid samples. It also incorporates measures of severity using biomarkers and a grading system for cognitive impairment. "We have to focus on biological or physical targets to zero in on potential treatments for Alzheimer's," explained Eliezer Masliah, M.D., director of the Division of Neuroscience at the NIA. "By shifting the discussion to neuropathologic changes detected in biomarkers to define Alzheimer's, as we look at symptoms and the range of influences on development of Alzheimer's, I think we have a better shot at finding therapies, and sooner." In an accompanying editorial, Masliah and NIA colleagues, including Dr. Hodes, highlighted both the promise and limitations of the biological approach. They noted that better operational definitions of Alzheimer's are needed to help better understand its natural history and heterogeneity, including prevalence of mimicking conditions. They also emphasized that the research framework needs to be extensively tested in diverse populations and with more sensitive biomarkers. The NIA-AA research framework proposes three general groups of biomarkers–beta-amyloid, tau and neurodegeneration or neuronal injury–and leaves room for other and future biomarkers. Beta-amyloid is a naturally occurring protein that clumps to form plaques in the brain. Tau, another protein, accumulates abnormally forming neurofibrillary tangles which block communication between neurons. Neurodegeneration or neuronal injury may result from many causes, such as aging or trauma, and not necessarily Alzheimer's disease. Researchers can use measures from a study participant and identify beta-amyloid (A), tau (T) or neurodegeneration or neuronal injury (N) to characterize that person's combination of biomarkers in one of eight profiles. For example, if a person has a positive beta-amyloid (A+) biomarker but no tau (T-), he or she would be categorized as having "Alzheimer's pathologic change." Only those with both A and T biomarkers would be considered to have Alzheimer's disease, along a continuum. 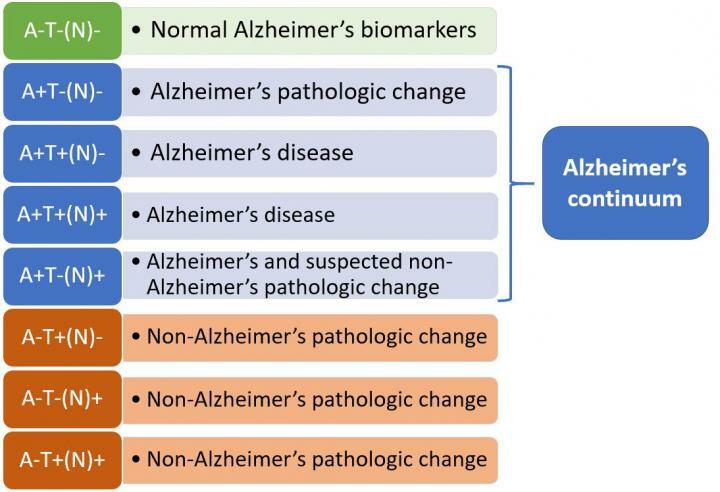 The N biomarker group provides important pathologic staging information about factors often associated with Alzheimer's development or worsening of symptoms. The authors emphasized that the NIA-AA research framework is neither a diagnostic criteria nor guideline for clinicians. It is intended for research purposes, requiring further testing before it could be considered for general clinical practice, they noted. They also stressed that the biological approach to Alzheimer's is not meant to supplant other measures, such as neuropsychological tests, to study important aspects of the disease such as its cognitive outcomes. In some cases, the article pointed out, biomarkers may not be available or requiring them would be counterproductive for particular types of research. The authors acknowledge that the research framework may seem complex, but stress that it is flexible and may be employed to answer many research questions, such as how cognitive outcomes differ among various biomarker profiles, and what the influence of age is on those relationships. About the National Institute on Aging: The NIA leads the federal government effort conducting and supporting research on aging and the health and well-being of older people. The NIA is designated as the lead NIH institute for information on Alzheimer's disease. It provides information on age-related cognitive change and neurodegenerative disease, including participation in clinical studies, specifically on its website at http://www.nia.nih.gov/health/alzheimers. About the National Institutes of Health: NIH, the nation's medical research agency, includes 27 institutes and centers and is a component of the U.S. Department of Health and Human Services. NIH is the primary federal agency conducting and supporting basic, clinical, and translational medical research, and is investigating the causes, treatments, and cures for both common and rare diseases. For more information about NIH and its programs visit http://www.nih.gov. Media are also directed to a news release from the Alzheimer's Association on this topic.